Incense, representing the element of air in most rituals, is quite easy to make. In making incense you will need to measure some liquids by the dram. The following recipes are all for granular incense, the type one burns on a round of charcoal. DO NOT USE CHARCOAL BRIQUETTES! They give off poisonous fumes when burned indoors. To make the incense, first powder all your solid ingredients and mix them well in your mortar and pestle. In a separate container, mix all of the liquid ingredients. Dissolve the saltpeter in the liquids. *Slowly* add the liquids to your powdered mixture. Spread in a small tin pan or plastic container that you do not plan to use for food any longer and allow to dry. The drying time varies but usually takes between 30 minutes and 1 hour. When dry, simply crumble up your incense. It is now ready to burn. Several of the following recipes call for Tincture of Benzoin. To make your own, powder 2 ounces of benzoin gum and add 4 ounces of water and 12 ounces of alcohol. Keep this mixture bottled and capped tightly for two weeks but do shake it daily. After two weeks, strain the liquid and bottle it for future use. your home with it to keep an atmosphere of love and happiness all around. This is an incense that can be burned during any type of meditation or prayer. This is a good incense to use during rituals designed to bring about dreams. It may also be used while attempting astral projection or while practicing divination. This is a success incense to be used in rituals to promote wanted success and prosperity in all aspects of life. This incense is to be used in rituals pertaining to money. This is an incense for rituals designed towards good health. This is an incense for attracting good luck. Some practitioners recommend burning this incense near an open window for 9 consecutive nights during the waning moon. This incense can be used to remove unwanted harmful energy from within a building. 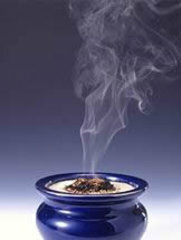 This incense can be used in rituals designed to protect something from evil influences or energy. It works especially well with Peaceful Home Oil. This is an incense used to destroy the power of someone trying to harm you but may also be used as an uncrossing incense.